Life's three major pleasures are scratching, sneezing and chocolate. It goes without saying that this dessert cafe had me upon reading the name. I was sold. 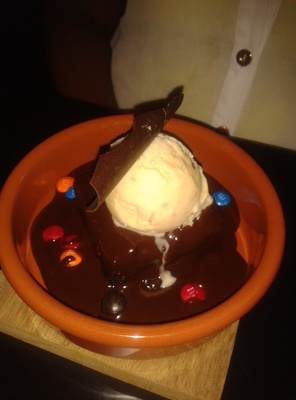 Having previously looked at some pictures my sister showed me of some of their desserts, I was visually impressed. At the very least, the presentation was sublime. But we all know what cameras can do these days so I was not entirely convinced. Of course, I have to report first hand experiences here, no gimmicks. Off I went in the spirit of primary research and I am here to report the truth and nothing but the truth about Chocolate Taperia. My unadulterated opinion is that their desserts are sinfully tasty. So sinful I will not be going back there for a while... not for any dissatisfaction on my part, but for the mere fact that I have gone way past my chocolate quota for the month and I am treading dangerously close to admonishment by the chocolate police, aka my partner. I was a green-eyed monster when my sister's dessert came. The Mmmm&m, aptly named, is simply divine. Just a forewarning, any attempts to try and allay your companion of their dessert will be futile. Believe me, we tried. If you love chocolate, the warm massage of a brownie, the crunch of M&M's and the delicious peanut butter ice cream is your hiding place from this heat. 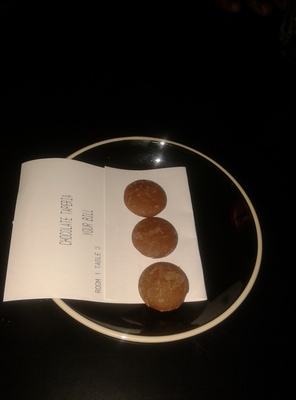 I ordered the movie night, which was a board of little mini delights. My other sister ordered the Flan, with a side of chocolate as is standard procedure in a dessert bar - chocolate is always an acceptable side. 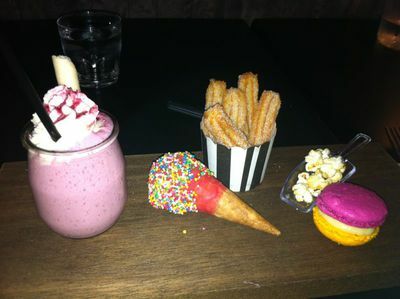 The movie night consists of a mini caramel popcorn, a mini sorbet cone, a mini smoothie, a mini macaron and mini churros. A little bit of everything for those who find it hard to decide-or simply like everything. 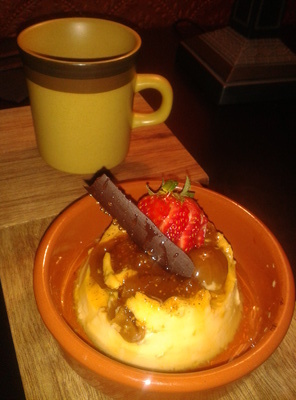 The flan is a little sweet treat, with honey and fig to compliment the caramel. What a treat. And, who wouldn't gush after receiving a little surprise with their bill? Take someone there, and put a smile on their face. Amazing, I can't even decide what sounds the best!